Western Digital has shaved its hard drives with the release of its 2.5-inch WD Blue 7mm, claiming it's the thinnest 1TB model in the world. Unveiling the drive at Computex, the company said it lays the ground for slimmer notebooks and compatibility with the industry-standard 9.5mm drive slots of mainstream notebooks. Matt Rudlege, Western Digital's VP and GM for Client Storage Products, said: "Users with large portfolios of content no longer need to sacrifice capacity when buying an Ultrabook or upgrading to a thin and light notebook." Western Digital has a nod from Intel, whose Capabilities Marketing Manager, Roger Bradford, related his company's release of its new Haswell Core processor to that of the WD Blue 7mm. 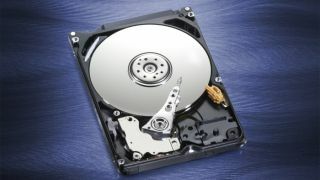 Features include: dual stage actuators to improve positional accuracy over the data track; a motor shaft secured at both ends to compensate for system-induced vibration and to stabilise platters for accurate tracking; and the SecurePark feature, which supports the hard drive's reliability by ensuring the recording head never touches the disk surface.